Tibumana Waterfall Bali is one of the most beautiful hidden waterfalls near Ubud. Luckily, only a few people know about it. It’s getting harder and harder to find secluded places in Bali since tourism is on the rise. This is why we were really happy to discover the beautiful Tibumana Waterfall, hidden deep in the jungle and with some of the most impressive sights in Bali. Looking for hidden waterfalls in Bali? Check out my full guide here! Chasing waterfalls has become one of the main activities for tourists visiting Bali. And who can blame them? 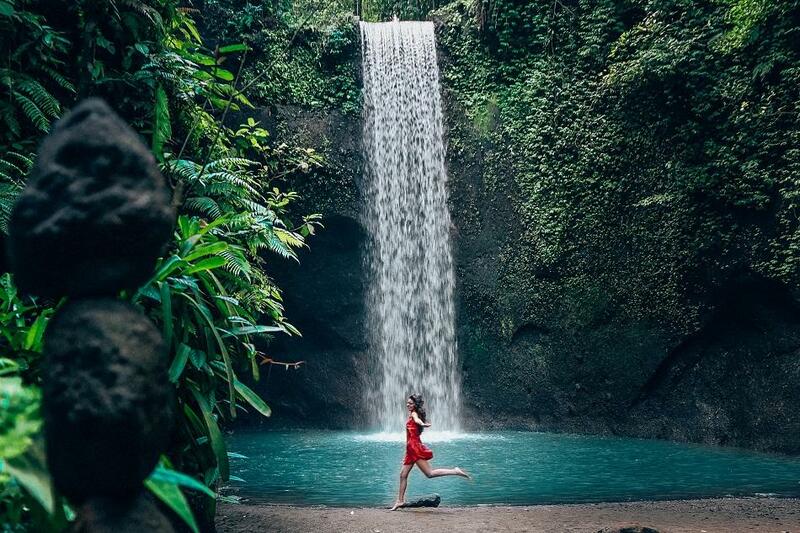 Instagram is full of photos with beautiful Bali waterfalls inspiring us to explore more and be adventurous. Tukad Cepung is another amazing waterfall near Ubud but for now, let’s discover Tibumana Waterfall! If you are staying in central Bali, then getting to this beautiful waterfall is easy, The road from Ubud to Tibumana Waterfall takes only about 45 minutes. The road is good and easily accessible especially if you are using Google Maps. Getting to Tibumana Waterfall from Canggu or Denpasar takes a bit longer (1 hour and 30 minutes) but it is definitely worth it. When you’ll get closer to Tibumana Waterfall, you’ll notice endless rice fields and palm trees. I loved that I had the chance to take a sneak peak inside the local people’s daily lives. You’ll see Balinese people taking care of their animals or wandering around the rice fields. Definitely something to remember! Don’t hesitate to take a break and take some photos! Once you’ll get to the Tibumana Waterfall parking, you’ll have to leave your car or motorbike there and continue walking for about 10-15 minutes. There are a few small shops near the parking where you can buy water or refreshments. I would suggest bringing your own water since the prices here are double. If you are planning to visit Tibumana Waterfall you have only two options: either you rent a motorbike or take a guided tour. I will give you more details below. Renting a motorbike in Bali is easy. Just ask at your accommodation and they’ll most probably have motorbikes for rent. If not, ask at hotels or guesthouses nearby. The price to rent one motorbike for one day in Bali is around 50,000 IDR, depending on your negotiation skills. If you are not feeling comfortable driving a motorbike, my advice would be to rent a car with a driver for a full day. You can also add some other nearby waterfalls to your itinerary such as: Goa Rang Reng Waterfall, Bangkiang Djaran Waterfall or Tukad Cepung Waterfall. Renting a car with a driver in Bali for one day will cost you around 45$. For prices, click here. TIP: Although renting a car is hustle free and you can definitely split costs with some friends, I love exploring new places by motorbike. It gives you the freedom to stop wherever you want to admire the views or just rest for a while. Also, it is the cheapest alternative. The entrance fee to this hidden waterfall near Ubud is only 10,000 IDR per person. Once you’ll get past the ticket office, you’ll have to descend some stairs. In order to get to any waterfall in Bali, you’ll have to go through the agony of climbing up and down the stairs. For me it became a ritual: I have to suffer in order to see the beauty. I might overreact a bit but after visiting 4 waterfalls in one day, I could barely feel my legs. Read more about the most beautiful waterfalls in Asia here! Once you’ll reach the valley you have the option to go right to see the temple or left to see the waterfall. Although the temple is not impressive, it is worth a visit since you are already there. The path to Tibumana Waterfall goes through the jungle and it’s a good opportunity to admire the exotic vegetation. You’ll first pass by a small waterfall before reaching Tibumana. I absolutely felt one with nature with all the butterflies and birds flying around me. Once you’ll get to the beautiful Tibumana, take a few minutes to read the rules. For your own safety, it would be best to follow them. I’ll also list the rules below. At any time big stones can fall from the waterfall so getting to close to it is not a good idea. Swimming in the lake is permitted and the water is warm enough to relax a bit and connect with nature. This hidden waterfall near Ubud is perfect to chill on a hot day. Tibumana Waterfall Bali is still untouched by mass tourism. Therefore, you still have the chance to enjoy its beauty without being interrupted. You can easily link your trip to Tibumana with another amazing nearby waterfall: Tukad Cepung. Enjoy this little piece of paradise and don’t forget to take some amazing photos!